Update on the fire engulfing the historic Notre Dame Cathedral in Paris, France. The Paris fire chief say they think Notre-Dame Cathedral's landmark rectangular towers have been saved from the fire. 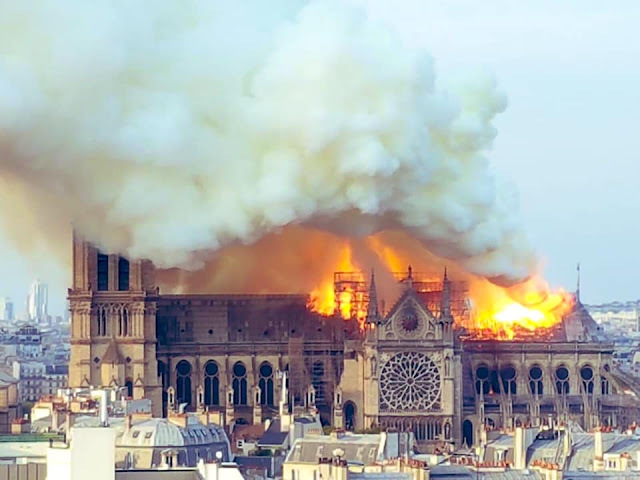 The cathedral went up in flames on Monday, April 15, 2019 in a blaze that has caused significant damage including the collapse of the 300 foot spire. Two-thirds of Notre-Dame's roofing "has been ravaged." One firefighter was injured; however the significant collection art work and holy objects kept inside the church has been recovered. A member of KTO Catholic Television, reported that “Fr. 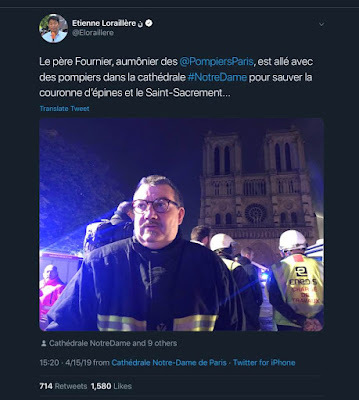 Fournier, chaplain of the Paris Firefighters, went with the firefighters into Notre-Dame cathedral to save the crown of thorns and the Blessed Sacrament.” Latest reports say that the main structure has been saved with 400 firefighters working to stop the blaze. The cathedral had been in the midst of renovations. Bronze statues were removed last week for work. The cathedral, dates back to the 12th century. It is a UNESCO World Heritage site that brings millions of tourists every year.